I want to thank much 2d23d for this wonderful add-on, which has never failed for me since 2012, and still works in the latest versions! What’s the latest version of this add-on and does it still work with 2.77 ? I just tried your addon to transfer some shapeKeys. Wow! Works like a charm! Super impressed how well it transfered it. @motorsep - I was able to transfer ShapeKeys on a 2.77 off of buildbot that’s a few days old. I’m pretty much a complete newbie here (in many respects, any way), so please forgive my ignorance. I’ve been teaching myself Blender for a short time (for modding Fallout 4), and have need of this utility. It looks like an amazing tool. I’ve successfully installed the addon to my Blender 2.77, but when I go to use this tool it does not give me …The Button. By “The Button” I mean I can tell it what source mesh to use and what mesh to transfer stuff to, but I don’t see an option to tell it to go ahead and start making the changes. I’m guessing there is a keyboard shortcut I’m unaware of? Or perhaps it is supposed to do it automatically, but if so, it does not seem (to my untrained eye) to be doing it. Mostly I’d just like to be able to transfer UV Maps from models that are very similar to one another, specifically bodies, to retain compatibility for textures from different mods made by the modding community to work with different meshes I make, myself. Some formats are more common than others, and this tool would be an absolute lifesaver. If anyone can help, I’d appreciate it. Thanks. For anyone who feels helpful but thinks the board is dead; I check it every day. I am here. Just sayin’. Thanks. That’s how it looks in the Data tab of the Properties panel, it’s quite self-explanatory, so I wonder whether you have it properly installed. You can’t transfer UV maps with it though. The Mesh Transfer Addon is for vertex groups and shape keys, but it does not do uv maps. It is located in the object data Tab next to the Modifiers Tab. It works best when both objects are of equal size and shape, and in the same location. 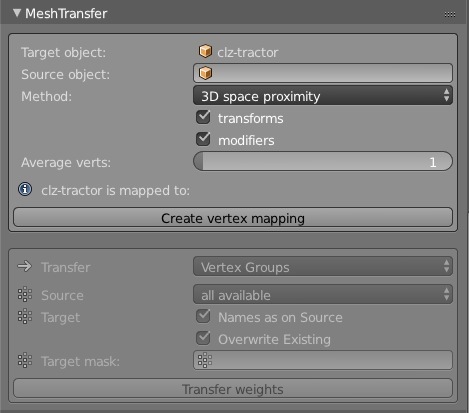 3.Click “Create Vertex Mapping” , and wait for it to complete. For uv maps, if the objects have the same topology, you can transfer the uvs by going to object mode, and selecting the mesh that needs the uvs, then select the mesh that has the uvs, and press CTRL+ L > Transfer UV Maps. If the topology is different, then you need to use the Data Transfer feature. That is awesome. Thank you both. There is SO. VERY. MUCH. that I need to learn yet. But this should at least be enough to get some help (if needed), do what needs to be done, and learn some more in the process. Do you plan to release an update for Blender 2.8 ? Your addon is very useful.